Speech Analytics may be described as the process of monitoring and analyzing the recorded calls ( .i.e recorded potential customers’ conversation with the call center agents) in order to obtain some business information since it is the customers who knows well about one’s business standard than any others. 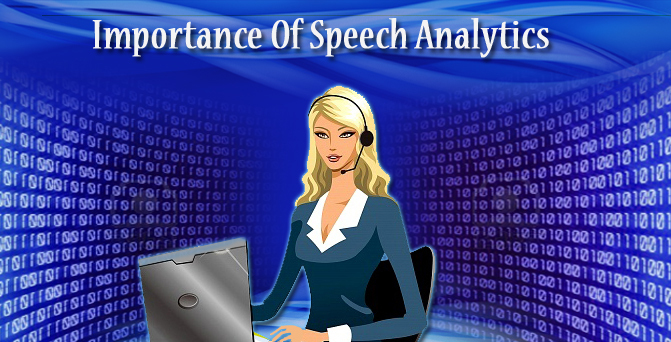 This speech analytics aids business or organizations by giving some priceless beneficial information about their firm. Speech Analytics is very important for most of the business or organizations to examine their promising quality, order and compliance. It tells about the customer’s experience while buying some products as well as getting some problem resolutions. Gives a clear understanding of what the customer really wants. Provides critical information for the better enhancement of the company as well as to improve the customer relationship. It helps the higher authorities at contact center agents to keep track of the customers as well as call center agents. This action helps them to know whether the contact centers are strictly following to the script provided as well as ensure that whether the current requirements are met. This is turn improves the service quality. Provides an increased revenue by cutting down the operating cost. This speech analytics is very important for sales oriented businesses since it recognizes the opportunities for up-sell and cross-sell, thus benefiting with an increased sales conversation rate. It also increases the strength of satisfied potential customers. Speech Analytics helps to convert an unorganized information into an organized one with the data captured from customer interaction. It also got the capability to embellish the contact centers and it is needed for most of the business or organization to enhance better quality management process and this can be achieved if and only if the necessary actions is being taken with the data derived from the speech analytics.